Electrical wiring is installed to provide a wide range of power options in your home. It is used for lighting, receptacles to power things like TV's, stereos, curling irons, and hair dryers. The wiring also feeds a variety of appliances, both big and small, throughout the home. These include ranges, ovens, refrigerators, freezers, dishwashers, microwave ovens, washers, dryers, toasters, blenders, pizza ovens, coffee pots, and crock pots, just to name a few. Installing the properly sized wire is essential for proper operation and electrical safety. In order to install any electrical wire installation, the proper wire size for the application is needed. But how do you know what size wire to use? Wire is sized by the American Wire Gauge (AWG) system. Your installation of conductors will depend on a few factors. The gauge of the wire, wire capacity, and what the wire will feed should all be considered. Direct burial cable is a special type cable that is designed to be run in a trench underground without the use of conduit to surround it. The electrical wires are encased in a thermoplastic sheath that seals out moisture and protects the wires within. As many of your homes have, overhead service entrances were the power entrance of choice for years. the downfall is wires running overhead, poles in your yard and the possibility of snagging a power. 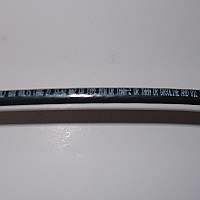 Usually, triplex aluminum wire was used to run from the power pole to the service entrance weather head feeding your electrical disconnect, that eventually powers your electrical panel in your home. Here are some great tips for determining the proper wire gauge, ampacity, and the maximum wattage allowed. Determining the proper size wire to use can be easy if you know what amperage and wattage a wire can carry per wire gauge. The trick is to have the right sized wired fitted to the power demand it will have on the circuit. Although some wires look the same and even look to be the same size, it doesn't mean that they can handle the amperage. For instance, copper wire can handle more than aluminum wire and should always be your choice of wiring to install in your home. Your home is wired with different types of wire. Each has its specific use to accommodate the load and conditions it is exposed to. Let’s examine what each type is and how it is used in the home’s electrical system. Electrical wire can be the stranded type or a solid form. Every wire except the ground wire is coated with a non-conductive coating of insulated material. Electrical wiring is rated in gauge for it's size and amp rating. The electrical wire can come in rolls or on spools. Lengths of wire vary from standard cuts of 50, 100, 250, 500 and 1,000 feet, but can be special ordered for specific lengths. The homeowner will generally choose the shorter lengths, while the contractors chooser much larger rolls, knowing that they will use it somewhere down the road. The homeowner's electrical jobs may be limited, unlike the contractor. The National Electrical Code requires that fixed appliances have their own (dedicated) circuit. These separate circuits are specific to appliances that must remain running at all times, like freezers, refrigerators, ranges, electric water heaters, and clothes dryers.